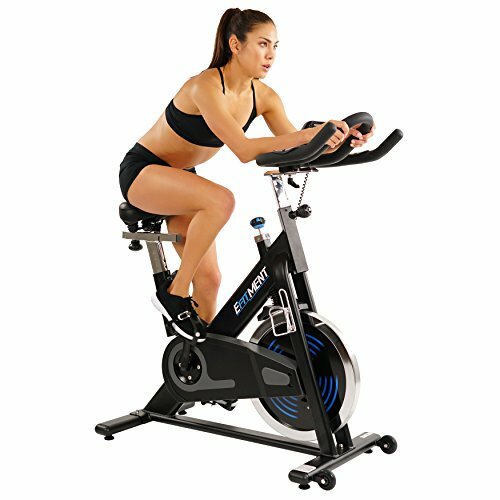 Train like there's no finish line with the EFitment IC031 Magnetic Belt Drive Performance Indoor Cycle Bike. Discover the power of the 40 pound flywheel and shatter your cycling and cardio goals while you keep track of your fitness progress on the digital monitor. Ride in style and luxury with additional accessories including the fully adjustable seating and handle bars, water bottle holder and the device/tablet holder. Improve your health and fitness and make this exercise machine the perfect addition to your in-home gym. DIGITAL MONITOR: A goal without a plan is just a wish. Start planning and recording your fitness statistics by using the advanced digital monitor which keeps track time, distance, scan, speed, calories burned and pulse. TRANSPORT WHEELS - Take advantage of the transportation wheels to simply lift the front of your bike and roll it conveniently from room to room or away for storage.